The Single Family housing market continues to suffer from a shortage of inventory. The resulting supply has increased price levels across the county. 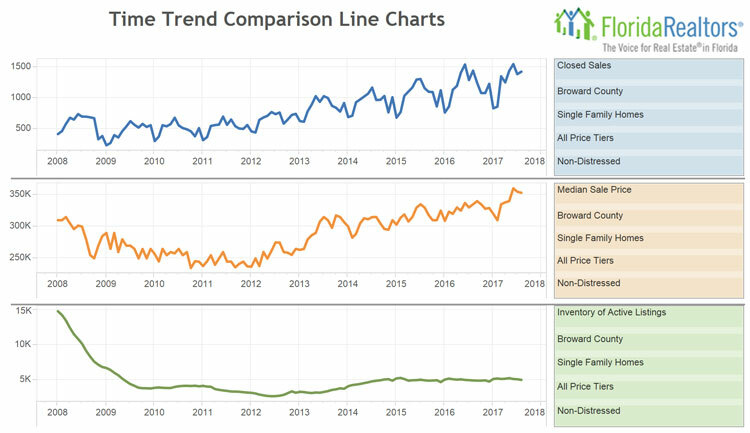 The overall market statistics above are still somewhat skewed due to the large reductions in foreclosures and short-sale properties in both new listings and closed sales. 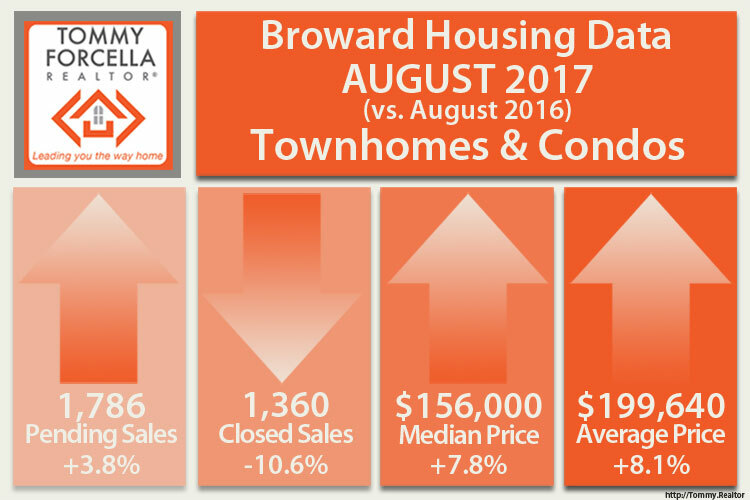 Closed Sales for August 2017 excluding those distressed properties decreased only 1.2%, representing only 17 homes. Reduced inventory exists for all homes priced under $250,000. The largest reduction in Closed Sale Price bands are also under $250,000. Months Supply of Inventory is approximately 4 months, maintaining a Seller’s Market in most cities within the county. The condo/townhouse market is fairly balanced. There is 5.6 months supply of inventory, however buyers seem to be weighing their choices carefully, as the Average Time to Contract is about 60 days, nearly twice that of single family homes. 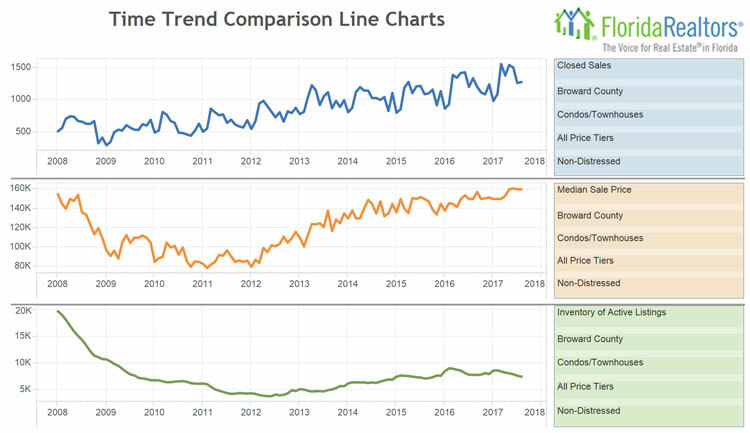 Reduced inventory levels can be seen in property under $200,000, but there was nearly a 7% increase in condos/townhouses priced between $200,000 and $250,000, which in the South Florida market is a good entry point for a first time home buyer. 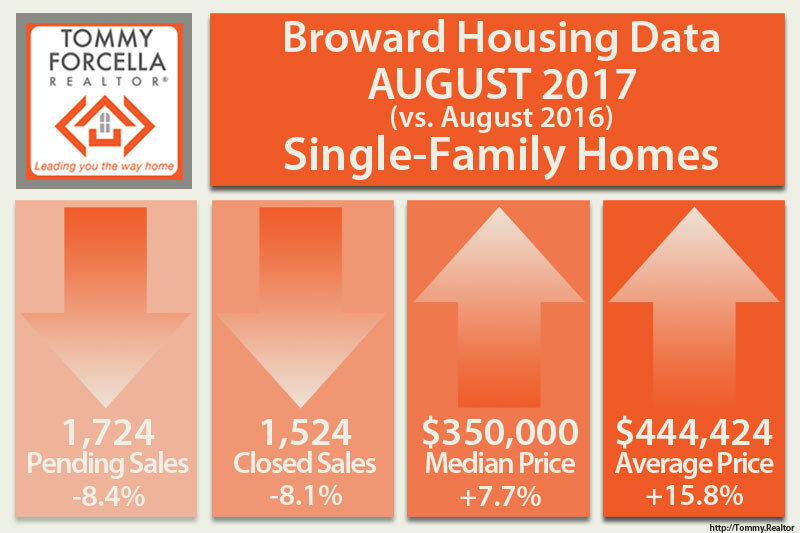 Excluding foreclosures and short-sale transactions, there were 4.4% fewer Closed Sales than during August 2016. Substantial reductions for property priced under $250,000. However, for property priced in the $250,000-$299,000 and $300,000-$399,000 brackets, there were 15.9% and 18.1% increases respectively. Those are very strong increases. The effects of Hurricane Wilma may show some delayed activity in the September statistics. Few due to storm damage, as the majority of delays are due to re-inspections by home inspectors, appraisers, and insurance adjusters. Notes: Statistics for each month are compiled from MLS feeds on the 15th day of the following month. Data released on Wednesday, September 20, 2017.